In the summer of 2012, two Brigham and Women’s Hospital researchers were asked to review a draft of a major cholesterol treatment guideline. They sent back a pointed critique, declaring that the authors should abandon a proposed heart-disease risk calculator because it overestimated patients’ chances of getting sick. So they were shocked when they saw the final guideline, which was issued last week by two leading heart groups. 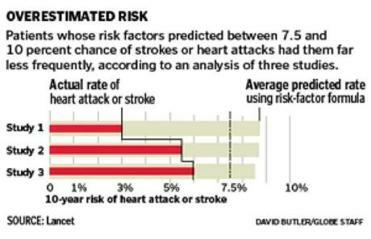 The risk calculator remained an integral part of the document and would be responsible for millions more Americans being put on cholesterol-lowering statin drugs to prevent heart attacks and strokes. The highly respected researcher — who made Time Magazine’s list of the 100 most influential people in 2004 — shook the cardiology world five years ago when a study he led surprisingly showed that giving statins to people with high levels of inflammation and normal cholesterol could reduce strokes, heart attacks, and heart disease deaths. He stirred controversy again over the weekend at an American Heart Association meeting in Dallas, where he launched a high-profile assault on the risk-assessment tool. Association leaders pushed back on Monday, vigorously defending the new recommendations at a news conference. They said they tweaked the guideline, partly in response to the comments from Ridker and Brigham biostatistician Nancy Cook, and pointed out that wider statin use can reduce heart attacks and strokes by 20 percent. The officials said they would review Ridker’s data, but some expressed annoyance that he had taken his concerns public. “We’d like to see this play out in scientific discussion rather than in the media,” said Dr. Donald M. Lloyd-Jones, one of the co-authors of the guideline. After the risk calculator was published last Tuesday, Ridker and Cook tested it by applying it to more than 100,000 people who had been followed for decades in Brigham-led studies. They found that it overestimated a person’s 10-year risk of having a heart attack or stroke by 75 to 150 percent, based on the study participants who later went on to develop these cardiovascular problems. In an emergency meeting on Saturday night, Ridker presented these findings to leaders of the heart association and American College of Cardiology, which jointly released the treatment guideline. The New York Times was the first to report on the groups’ review of the alleged flaws. The Brigham researchers also wrote up their analysis for the broader medical community, and it is being published Tuesday by the medical journal Lancet. “It is possible that as many as 40 to 50 percent of the 33 million middle-aged Americans targeted by the new guidelines for statin therapy do not actually have risk thresholds exceeding the 7.5 percent level suggested for treatment,” Ridker and Cook wrote in the Lancet commentary. The treatment guide urges physicians to prescribe statins for patients between ages 40 and 75 whose 10-year-risk of having a heart attack or stroke based on the calculator is 7.5 percent or greater. The assessment tool takes into account a person’s age, race, gender, and heart risks such as high blood pressure and cholesterol. On Monday, Dr. David Goff, cochairman of the committee that created the assessment tool, said he and his colleagues carefully reviewed comments from Ridker and others last year and ultimately decided to stick with the risk calculator. “We noted an overestimation of risk from our own validation studies,” he added, which led the guideline authors to settle on 7.5 percent as the cutoff for defining an elevated risk rather than 5 percent. Cook told the Globe that she would gladly provide the committee of experts with more extensive data if they ask. He pointed out that the risk calculator sometimes underestimated risk: A woman in her mid-60s with a very high “bad” LDL cholesterol level of 180 would have a 10-year heart attack and stroke risk of just 4 percent using the calculator. That is too low to qualify her for statin use under the new guidelines, but Ridker said he would “definitely treat” such a patient with the drug. Ridker emphasized that he agreed with the “vast majority” of the new recommendations. These include taking stroke risk as well as heart risk into account when determining whether to prescribe statins and a focus on using more powerful statins to prevent heart attacks. Doctors have also been discouraged from driving LDL cholesterol levels down to certain target measurements and using nonstatin drugs, such as fibrates and niacin, to improve cholesterol levels. Even as Ridker was upsetting some of his colleagues in Dallas, he was being honored at the meeting as one of six scientists receiving the heart association’s version of a lifetime achievement award — for his role in advancing this scientific knowledge. Correction: An earlier version of this story misidentified the title of Dr. Peter Libby. He is chief of the division of cardiovascular medicine at Brigham and Women’s.